Are you a wallflower—somebody who sits on the sidelines? Prepare to get out of your chair because Jesus has invited you to dance! Encouraging you to leave the passive behind, Weece helps you live out your faith by using the dynamic words Jesus did—“come,” “rest,” “learn,” “hear,” “give,” “go,” and “love”—and by putting them into action. Wouldn’t it make sense that those who claim to love Jesus would love the same people Jesus loves? Nouns need verbs, a requirement that’s more than just a grammatical truth; it’s a spiritual truth. The noun Christian and the noun church require action verbs to fulfill their purpose. That’s why Jesus invites Christians and churches everywhere to perform the greatest action of all: loving people. Jesus Prom is an extravagant party that celebrates the very people Jesus died to love. You will laugh and cry as you move through the pages of this book, and by the end of it, you’ll want to join the dance. When I first was asked to review this book, I wasn’t sure what to expect based on the title. As I began reading the first few pages, I still was unsure. This book is definitely different from my normal choices. However, I think it has more appeal to high school and college aged young adults. The author takes the reader through life events that show what can happen when we do not join in the dance God has called us to be as Christians. One chapter speaks about surrounding ourselves with friends who lift us up and not tear us down. This is especially true for the young adults leaving the Christian community they were raised and attending college. I have personally blogged about being careful who we surround ourselves with. As Christians, we carry this belief that we can be a great influence on the worst sinner to pull them up out of the ditch they’re in, which is true in itself. However, what happens more often than not is that it is the Christian who is pulled down, rather than the sinner pulled up. Proverbs 13:20 tells us to “walk with the wise and become wise; walk with fools and become fools.” WOW! How guilty was I in those college years?! I recently reviewed the book Enough and I think Jesus Prom is good follow up for the older teens and college aged adults. Looking back at your prom, what do you remember? What made a lasting impression? Did your prom night change how you look at people? How you look at yourself? How you look at love? 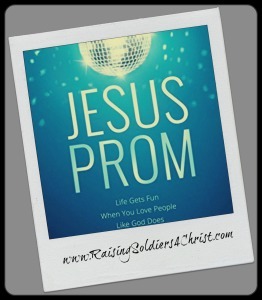 Read Jesus Prom and think about those questions. Think about the stains of your past, stains of your stories, and then think about Christ. We are not strong enough to make the stains go away on our own. We need Christ to remove those stains. He makes all things new again. He turns our stains into stories—stories that we can use as a testimony of the wonderful grace and mercy of our heavenly father. Stories that can show the world how strong our God is. A Christian is the singular representation of Jesus on earth. And a church is the plural representation of Jesus on earth. Those of us who are close to Jesus should struggle to see any difference between a Christian and a church. I loved the last chapter and the subject of add-verbs. Don’t just serve; don’t just give; don’t just love. Instead serve joyfully; give sacrificially; love recklessly. It is amazing what can happen to your life when you add adverbs. I give this book a 3/5 because it moved from one story to another quite often. It is a good book but was difficult for me to follow. To order a copy click below! Previous Post: « Family Toolbox A Program for Parents and Teens!! !